This is something I always order if I see it on the menu. The longer you leave the meat to marinade the better. Overnight is best, but if like me, you’re not that organised and/or greedy you can leave it for an hour at the least. 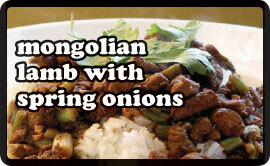 Combine all the marinade ingredients – add the lamb and leave for as long as you like but for 1 hour at least. Heat a wok with 1 tablespoon of the peanut oil until hot. Fry the spring onions for a couple of minutes until browned. Remove from the pan. Add a little more oil, Take the lamb out of the marinade and add to the pan in 4 batches, cooking each until slightly browned but not completely cooked (about 2 minutes). Remove and add to the onions as you go. Return all the meat and onion back to the pan with any juices and cook for 1 minute until cooked. Once again, remove the meat from the pan, leaving the juices. Add the remaining marinade along with the chilli sauce and hoisin sauce and boil for 3-4 minutes until the sauce thickens into a syrupy consistency. Spoon the sauce over the lamb and serve. With plain boiled rice and some steamed chinese broccoli.